While I truly love cookies, bar recipes are a lot easier! Fill the pan, bake and cut; what could be better? 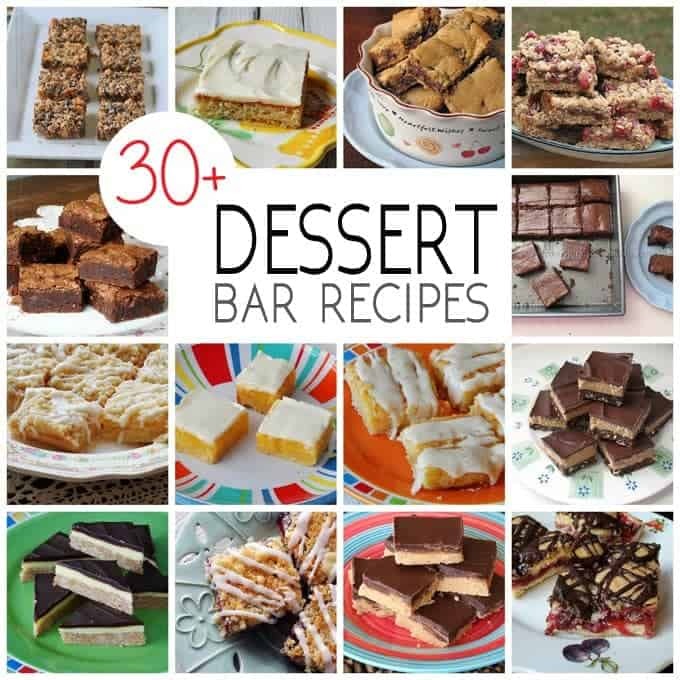 I love all sorts of dessert recipes, but bars are the best! Brownies, blondies, cookie bars and fruit bars. They are quite portable, easy to store and they’re great for popping into a lunchbox. I’ve posted quite a few bar recipes over the years. 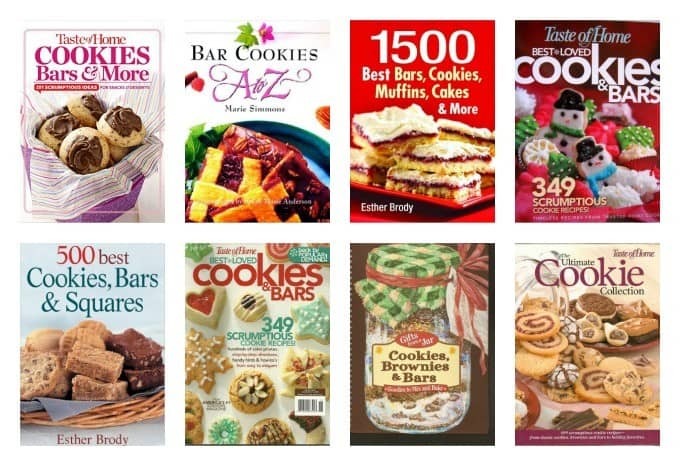 You can browse all my cookies, brownies & bars here, or use the links below to go to just the individual bar recipes. Each one has a printable version for your convenience. Fudgy Blender Brownies – Yes these brownies are made in the blender and baked in the oven to chewy perfection. Lemon Streusel Squares – Lemon curd lovers will adore these tangy sweet bars drizzled with a confectioners’ glaze. One Bowl Fudge Brownies with Peanut Butter Frosting – That’s right, one bowl is all you need to mix up a batch of these fudgy brownies. Pecan Pie Bars – All the flavor of pecan pie without the hassle of making a pie! No-Bake Peanut Butter Pudding Bars – A combination of Rice Krispies, peanut butter, pudding and Corn Flakes creates a surprisingly delicious no-bake treat. Fudge Frosted Espresso Brownies – If you love coffee flavored desserts, these fudge frosted bars are for you. Peanut Butter Chocolate Layer Bars – Sweetened condensed milk, peanut butter and chocolate chips makes an amazing filling for these crumble topped bars. Banana Bars with Vanilla Cream Cheese Frosting – All the flavor of banana cake in a condensed bar, frosted with a sweet cream cheese mixture. Tropical Dream Dessert Bars – This bar recipe is filled with tropical ingredients such as dried apricots, orange juice and crushed pineapple. No-Bake Peanut Butter Bars – These bars are full of peanut butter flavor and only uses five ingredients! Lemon Bars with Sweet Sour Cream Topping – You’ll make your own lemon filling for this sweet and tangy dessert bar. Cherry Berry Streusel Dessert Bars – One of my favorite bar recipes, this one uses both cherry jam and red raspberry jam as the filling. S’mores Bars – Melted marshmallows and chocolate are sandwiched between warm, chewy cookie dough! Chewy Cookie Crunch Bars – A combination of chocolate cake, Rice Krispie treats, peanut butter and chocolate make this sweet dessert hard to resist. Peanut Butter Chocolate Chunk Bars – If you love chocolate chip cookies but want to make them in half the time, these bars are the best! Chocolate Cheesecake Brownies – These cheesecake bars are the best of both worlds. Creamy cheesecake and chewy brownies in a single sweet bar. Chocolate Topped Peanut Butter Bars – These layered bars are the perfect combination of chocolate and peanut butter! Brown Butter Chocolate Toffee Blondies – These bars are dotted with chopped pecans and chocolate toffee bits. Cherry Pie Squares – Break out the cherry pie filling for this amazing chocolate drizzled take-along dessert. Blackberry Pie Squares – This recipe uses blackberry pie filling and a marvelous dough to create an amazing cake-like dessert. Almond Cheesecake Bars – If you love almond flavor and are a cheesecake fan, these bars are a definite must try. Chocolate Oatmeal Almost-Candy Bars – I love that this recipe uses an array of ingredients such as raisins, peanuts, chocolate chips and old fashioned oats. White Chocolate Pumpkin Blondies – These mini-pumpkin blondies are perfect for fall topped with sweet white chocolate frosting. Chocolate Brownie Bars – Such a simple from scratch recipe that you really must try! Espresso Cheesecake Brownies – Another bar that combines cheesecake and brownies, but adds another dimension: coffee! Applesauce Spice Bars – Thus wonderful autumn dessert is filled with flavors of apple, raisins and pecans. Chipster Topped Brownies – It’s cookie batter on top of brownie batter to make one irresistible dessert bar. Almond Cake Bars – These simple bars are full of flavor and start with a box of cake mix! Cranberry Caramel Bars – use fresh cranberries, oats, chopped dates and chopped pecans. A jar of caramel sauce tops it all off. Chocolate Chip Blondies – This recipe is very similar to classic chocolate chip cookies but in bar form. Blackberry Cheese Streusel Bars – Surprise! This fabulous bar recipe includes Mozzarella cheese! Chocolate Chip Coffee Snack Bars – These no frill chocolate chip bars are perfect with a cup of coffee of hot cocoa. Seven Layer Bars – This dessert bar is made by layering each ingredient on top of the next, including graham cracker crumbs, coconut, chocolate and butterscotch chips, sweetened condensed milk and pecans. Cocoa & Cream S’mores Bars – These ooey gooey bars have a chewy cookie base filled with marshmallow and chocolate. Berrylicious Cookie Bars – Easy to make, packed with delicious berries, and kid approved… they’re perfect for an after school (or anytime) snack! Red Velvet Oatmeal Fudge Bars – Rich and creamy, these delectable bars are two desserts in one! Easy Homemade Candy Bars – These graham crackers slathered in peanut butter and dipped in chocolate are just as good, if not better than Starbucks! Conversation Heart Brownies – So much better than actual conversation heart candies, and the perfect sweet treat for your sweetie! Marbled Mint Cheesecake Brownies – Though they are a great St. Patrick’s Day snack, these brownies are delicious all year round! Shamrock Shaped Brownies – There’s nothing better than edible shamrocks for St. Patty’s Day! Frosted Sugar Cookie Bars – Whether it’s spring, Easter or just Tuesday, these adorable sweet treats will satisfy your sweet tooth. Funfetti Marshmallow Cereal Bars – Rice krispie treats don’t have to be so plain. Add a little color to your dessert! American Flag Brownies – Nothing says America quite like an American flag made of powdered sugar, frosting and blueberries on your favorite dessert! Chocolate Chip Blondies – Blondies are the best of both worlds – cookies and brownies! Your recipe for Easy Frosted Bar Sugar Cookies was in my local paper this past Saturday (Dec. 1, 2018), and I was just wondering if it could be made into a cut-out cookie or drop cookie? 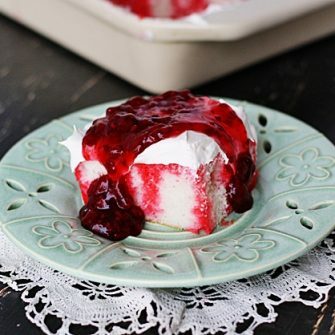 I have been looking for a good cream cheese cookie recipe and have not been able to find one. Maybe this recipe would work. What do you think? Thank you. I’m sugar it could! Please let me know if you try it and how they are! Everything looks so tempting…..for those of us that have NO will power can you please have recipes that don’t have at least 30000000 calories in it.